Do you want to get rid of your belly and have a toned one instead? Well we have just the moves for you! These moves are specifically designed to raise your heart rate and work off your fat. You can incorporate any of the moves into your current workout or use them as a complete workout and turn them into a circuit to burn off over 500 calories. Put these moves in your workout and consider the days of unwanted body blubber numbered! Just complete two reps of each exercise for 20 sets in 30 minutes. Begin by resting on your hands and knees, palms flat on the floor and arms extended directly below your shoulders. Lift your right knee off the floor and twist your hips to the left, pivoting on your left foot and drawing your left arm around as you extend your right leg out to the side. Draw your right leg back in and return to the starting position, before immediately alternating legs for the next rep. Begin standing with your feet shoulder width apart, holding a pair of dumbbells at around ear height with your upper arms parallel to the floor. Jump up spreading your feet out and simultaneously press the dumbbells upwards over your head. Hop back to the starting position and as you do, lower the dumbbells back to the sides of your head. Set up in a push up position, with your arms extended directly below your shoulders and your body forming a straight line from head to heels. Keeping your core braced, lift your right foot and draw your knee up towards your chest. Return to the starting position and alternate to your left leg, keeping the intensity high. Begin standing tall, then step forward with your left foot and drop into a lunge by bending the front knee. Lower until your right knee brushes the floor, then drive explosively through the hips to switch the position of your legs, cushioning your landing by dropping into the next lunge. Use your arms for propulsion and aim for as little vertical lift as possible. Lift your right hand off the floor and extend your arm outwards at 90 degrees. Slowly raise your arm up and around in an arc, keeping your eyes focused on your hand as you pivot on your left foot and twist your upper body. Bring your right hand down to the floor as you complete a full 180 degree turn, so that you finish facing the ceiling. Now lift your left hand and bring it over your body, supporting yourself on your right arm as you pivot once again and assume a push up position. From here, complete one push up by lowering your chest to the floor and exploding upwards. Repeat in reverse to perform your second rep. Hold the barbell at shoulder height, using your hands to support the bar with palms facing up and wrists facing forwards. With the bar resting across your upper chest, lower yourself into a sitting position by pushing your hips backwards. When your thighs are parallel to the floor, drive up through the legs, using the momentum to extend your arms directly overhead to perform a shoulder press. Slowly lower the bar back to your chest, then go again. Drop down to place your hands flat on the floor, kicking your legs back into a plank position as you lower your chest to the ground. 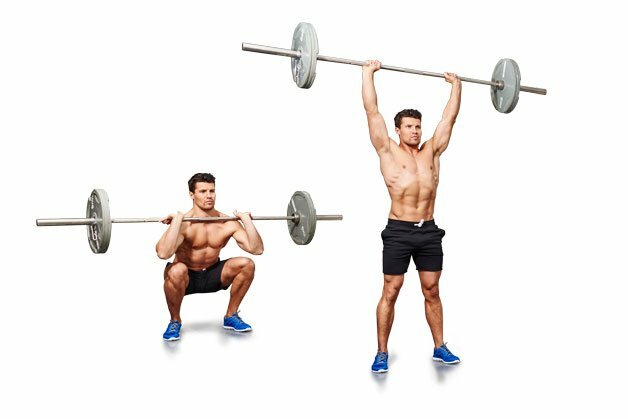 Hop your legs in towards your body so your feet are flat on the floor, then extend your arms and rise up into a shallow squat. Use your arms to propel yourself into a tuck jump, bringing your knees up towards your chest until your thighs are parallel with the floor. Focus on your core stability as your perform this move, and avoid jerking your arms or legs into position. Begin by lying on your back on a gym mat, legs out in front of you. Raise your legs up and outwards at 45 degrees, simultaneously contracting your abs and reaching forward between your thighs. Hold the position for a moment when your upper back is off the floor, then slowly lower yourself back to the starting position. Set up in a bent arm plank position by resting on your forearms, with your palms flat on the floor and your body forming a straight line from head to heels. Squeeze your triceps and push through the palms to raise your elbows off the floor, without flaring them out to the sides. When your arms are fully extended, slowly lower yourself back to the starting position. With a light pair of dumbbells hanging by your sides, set up with your heels elevated on a weight plate or block, 1-2 inches off the floor. Push your hips back and bend at the knees until your hamstrings and calves come into contact, keeping your spine neutral and core braced throughout the movement. Squeeze your squads to extend your legs and return to a standing position.